I wrote “Okita Souji”. He was the captain of the first unit of Shinsengumi. Okita is two kanji symbols in right. It’s the family name. 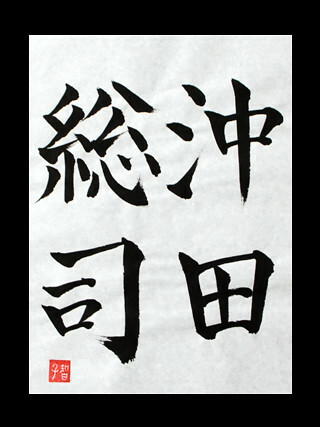 Souji is two kanji symbols in left. It’s the first name. He was one of the best swordsmen of Shinsengumi. He seemed to often play with neighboring children innocently.